A NEW therapy garden has been unveiled at the Wessex Multiple Sclerosis Therapy Centre in Warminster, which will help members battling the condition. 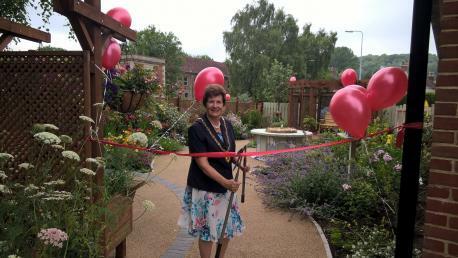 Rosie Eliot, manager of the centre at Bradbury House, said: “The official opening was a great success especially when the Mayor of Warminster, Sue Fraser, cut the ribbon using a pair of garden shears. “We were so pleased to have lots of pupils from The Avenue School there who helped us get through mountains of donated cakes. “We even had a member of the Multiple Sclerosis National Therapy Centres (MSNTC) who said our centre in Warminster was one of the best in the country and the therapy garden was a triumphant addition to what the charity can offer to people with multiple sclerosis. “I have to add it is such a pleasure to see so many members using the garden as part of their therapies. Designed by Marion Dale, the garden has been created with wheelchair users and those suffering with mobility issues in mind and includes a water feature and picnic table, with the base – consisting of eight mosaic titles – created by Avenue School pupils. A grant for £10,000 was secured from the Big Lottery Fund and additional cash and supplies were raised from local companies such as Sydenham’s, Cordons, Batsford Timber, Barters Plant Centre and local charity the Fudge Trust.